The Pittsburgh Global Game Jam is back for 2018 @ Nova Place from January 26th-28th, 2018! Registration is open now! This year’s Global Game Jam takes place from January 26th – 28th! The Pittsburgh GGJ site can support 150 jammers. Registration is handled by first-come, first-serve. The registration fee is $35 and covers the entire event including food and GGJ t-shirt. For more information visit the Global Game Jam website and Pittsburgh GGJ@Nova Place site. What is a game jam? What is the Global Game Jam? Read the basis here. 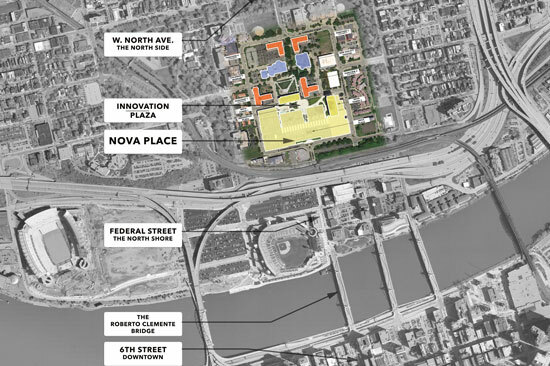 Nova Place is a 30 acre mixed-use, urban redevelopment project located on Pittsburgh’s historic North Side. Nova Place is conveniently near such landmarks like the Children’s Museum of Pittsburgh and the Warhol Museum. The Pittsburgh IGDA is happy to announce that Nova Place is hosting the Pittsburgh Global Game Jam again for 2018. Parking is available in the underground garage throughout the weekend. Jammers will be able to receive a prepaid parking ticket for the garage. We recommend people carpool for the event. Here are detailed instructions on how to get to Nova Place. For those looking for public transportation, here are some quick Google Map links to help arrive at Nova Place on 6 PM for Friday. Please check all routes and times to confirm. If you are having trouble getting to the jam, please contact mike@pigda.org prior to the event. The Pittsburgh Global Game Jam is generously supported by the following sponsors. If you need to arrive late, please contact mike@pigda.org to make arrangements. Your creativity, collaborative spirit, and enthusiasm! For the latest news from PIGDA visit our Facebook page.